I was born in Toronto, Canada and grew up listening to the sounds of Motown in my basement. Went to NYC became a designer....Music came late for me, I didn't start really performing until well into my 30's when I met Cliff and had to get over stage fright and other things. We began playing blues after being inspired by bluesman Keith Brown at The Bamboo Room in Lake Worth, Florida. The blues finds it's way into your life, no matter who you are or where you came from. I've had the blues, big time. Been up, been way down... Our songs feature the harmonica playing of Jason Ricci, our good friend and harmonica superstar. Cliff Guest has been a musician as long as he can remember. From the moment he got his first Kent Hollow Body Electric guitar, at the age of 14, the magic of music would always intrigue him. The only son of a Miami cop, Cliff honed his skills coming up in the Miami club scene in such clubs as The Wreck Bar, The Inner Circle, Art Stocks Playpen South (where he played drums in the house band for four years) just to name a few. While playing at the Wreck Bar, Cliff was spotted by Ray Munnings of Funky Nassau fame and was offered the drum gig on Ray’s worldwide tour. He took it! Moving on, Cliff then formed the Miami Film Mafia with other talented filmmakers and began producing and directing independent films. He went on to win Madonna’s “Make My Video” contest in 1986 and as a result landed a job at Geffen Records in Los Angeles heading up Geffen’s newly formed in house video department. While there, Cliff worked with many well know Geffen artists. Cliff returned to South Florida to direct his feature film “The Disturbance”, now a cult classic among horror fans worldwide. Today Cliff plays guitar, bass and drums at venues in South Florida. His versatility is an asset to bands such as Heidi and The El Cats, the Southside Blues Band and others. 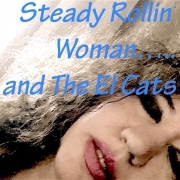 Heidi and the El Cats signed with EOS Music Corp and our songs are being played in retail stores and restaurants. Performed in three international blues festivals/corporate events/private parties/clubs. Recorded three albums. Assistant to film director Cliff Guest. Producer, Co-writer on projects. 2018 Producer for Blues Harmonica Artist Jason Ricci Music Video, “I’m Too Strong”. Casting, Production Assistant. “Gigging with The Blues Crusaders”, “Shopaholic Webisode # 3”, “Tales from the Blue Zone”. Thank you for your submission to the 2018 American Zoetrope Screenplay Competition. We appreciate the opportunity to read your work. We announce results February 15; and in the meantime, should you have any questions, please write us at contests@zoetrope.com.